We’ve officially made it to Q4, and for many of you marketing mavens out there, this is the make it or break it season. To help send the very best holiday email marketing campaigns and engage with customers during the busiest season, here are insights from holiday emails past that broke through the inbox hubbub. 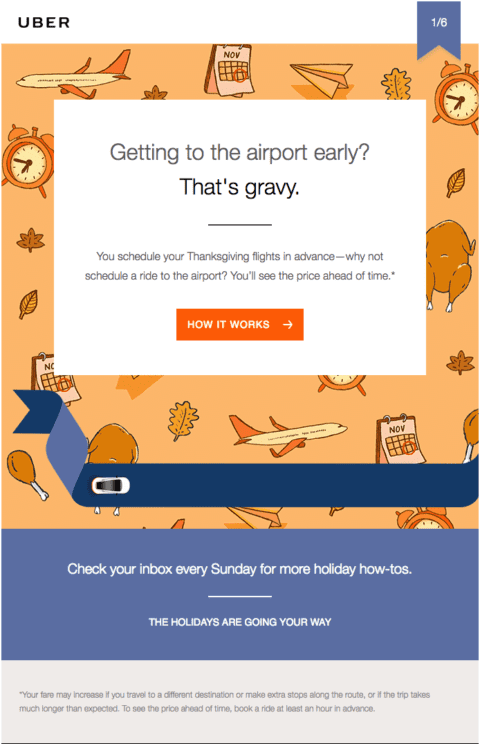 Uber’s email “Flying to the feast? ✈️ 🦃” caught my attention as I, like many Americans, fly home for the holidays. Sent on the Sunday before Thanksgiving, it’s timely, relevant, and short! We found that the emails with the highest engagement have 4 words in their subject lines. What is probably my favorite element of the email is its frequency. In the top right corner, it displays 1/6, and toward the bottom, Uber says to check back each Sunday for more useful holiday tips. This scheduled plan of 6 emails, 1 per week, sets expectations from the beginning of the email series. Rather than inundating you with email deals daily, Uber looks to provide quality over quantity. Recipients get bombarded with emails during the holiday season, and you don’t want to be a part of the noise that doesn’t get through. Remember, it doesn’t matter how many you send if the content isn’t useful or applicable. Uber provides a solution to every traveler’s dilemma—how do I get to the airport? Do you drive and park, get a ride from a friend, order a cab? No, you can schedule your Uber ride in advance. By providing a solution to a common need over the holidays, Uber goes above and beyond in their email content. When sending emails, think about problems you can help your recipients solve. Can you make their seasonal shopping easier by providing a holiday gift guide? Or suggest solutions to holiday travel, like Uber? Framing your content in this manner will position your emails as helpful, rather than salesy or pushy. MeUndies has some great subject lines. My favorite from last year’s holiday season is, “Keep your pants on, it’s almost Black Friday…” It’s cheeky, made me laugh, and want to open their email. But there’s actually another email that I want to focus on, it stood out from the crowd not because of its humor or promotional deal, but because it promoted a good cause. After all, there’s much more to the holidays than gifting. We all get caught up in our own lives, our own brands, and forget to step outside of our bubble. MeUndie’s “Cyber for Good This Monday” email takes a very different approach from the other Cyber Monday emails I received. Rather than pushing promotional deals and talking about its ultra-comfy products, it focuses on Grace, an 11-year-old girl with cancer who wishes to be a celebrity. MeUndies’ push to the website was to shop on Cyber Monday for 10% off and 10% of the sales went to the Make-A-Wish foundation. 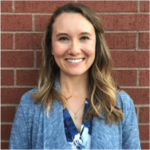 It’s refreshing to have an email that isn’t solely focused on promotions, which is probably why subject lines without a percentage discount tend to perform better than those that do. But, if you’re nervous about taking your eye off the prize on the big day, then try testing it out. See how your recipients engage with your promotional versus cause emails leading up to Black Friday. A simple call-to-action button at the end of the copy directs recipients to shop for a good cause. Let the content of your emails decide the tone of your call-to-action. Since this is a more heartfelt email, the simple copy fits in well with the overall message. For an email with more holiday pizazz, get creative and test call-to-action copy that has some holiday flare. Consider staying away from the in-your-face red and green flashing sale signs and the holiday email Christmas jingles. We can still have fun with the holidays without over-stimulating (or sometimes annoying) our recipients. Blue Apron does a great job of making you hungry as soon as you open their emails. Bright fall colors and savory meals are the centerpieces of their holiday emails. In your emails, think about how you want your recipients to feel. Do you want to evoke feelings of warm and cozy winter fires, crisp and brisk fall leaves, or icy storms? It’s easy to spend hours creating your email from building the template to choosing images and writing copy. Fortunately, there are enough tools out there that it doesn’t have to be a grueling process. With these great non-stock photo resources, you can find images that match how you want your recipients to feel. Our free, ready-to-go email marketing templates make adding images and content simple so that creating beautiful emails can be a quick, streamlined process. Sometimes brands get a little carried away with the fa-la-las and the ho-ho-hos in their holiday marketing. When you’re writing holiday emails, remember this could be the 3rd, 12th, even 30th email that recipients have read with a Christmas language reference. Take advantage of the fun holiday jingles and terminology, but don’t go overboard. 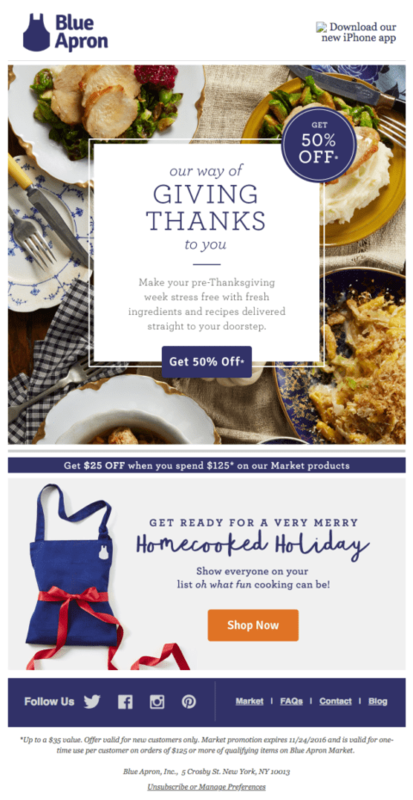 In Blue Apron’s theme, they have fun with Thanksgiving and Christmas themes without hitting you over the head with it in their copy, design, and imagery. For other copywriting tips, check out our guide: Awesome Email Copywriting: A How To With Examples. Every year I rack my brain trying to figure out what to get for family members and friends, so for me, some of the most helpful holiday emails are the ones that give you gift ideas. In this email, Groupon suggests that I “Unwrap a Memory,” and provides a list of experiences in my area. Try personalizing your emails by segmenting your email list. 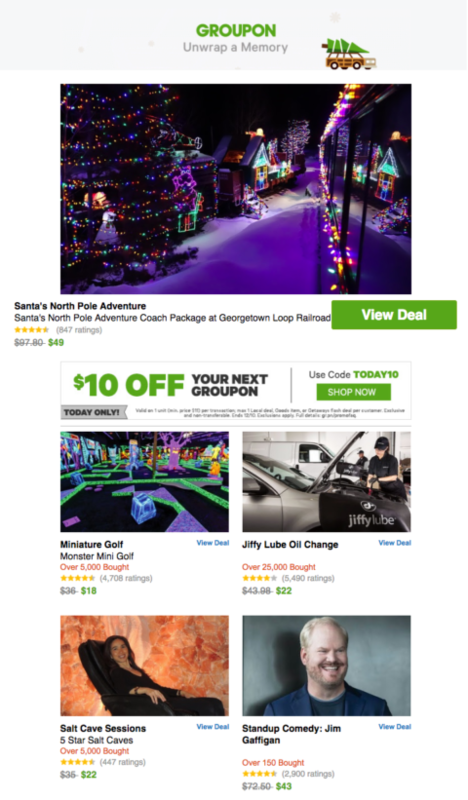 Groupon segmented their list by location in order to provide area-specific experiences. You can also segment your lists by demographic, or a great one for the holidays is by past purchases. Customizing your emails for your recipients helps drive higher engagement and revenue growth. We know it’s hard to stand out in a crowded inbox, but with these email marketing examples and all of the resources at your disposal, you’ll be well on your way to email success. For more email insights, check out our guide, Be an Email Superhero: 8 Ways to Beat Your 2018 Email Goals Right Now. You’ll find your inner email superhero just in time for the all-important holiday email sending season.